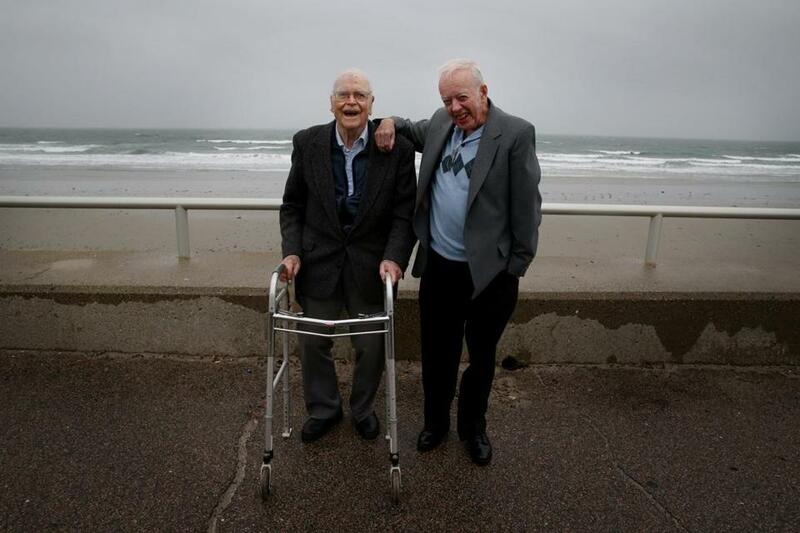 Robert Lautzenheiser (left) and F. Robert Skilling have recorded the weather in meticulous detail for more than 55 years each. HULL — Robert Skilling was just a teen when he bought a barometer, a U-Tube thermometer, and a $4 plastic rain gauge, and began dutifully logging the daily weather stats on onionskin paper. He hasn’t missed a day since. And for the past 55 years, he’s been reporting snowfall, rainfall, and highs and lows for the National Weather Service, which honored Skilling on Wednesday for reaching that rare milestone. But to be precise — and when it comes to the weather Skilling is exactly that — he pointed out that he in fact began his daily logs of meteorological data in 1953, when he was just 15. The National Weather Service recognized Skilling, 77, and fellow weather reporter Robert Lautzenheiser for their decades of service to its Cooperative Weather Observer program, which consists of more than 10,000 volunteers across the country. Their reports, which include maximum and minimum temperatures, 24-hour precipitation and snowfall, provide a wealth of daily information that helps document the climate and measure long-term changes. “The climate of the US is done by the people of the US,” said Kimberly Buttrick, who oversees the region’s cooperative program. To have two observers log the weather every day for so many years, she said, was remarkable. “I don’t think we’ll see this again,” she said. The weather service’s Taunton office manages 70 observing stations across southern New England. Most observers, dubbed “citizen-soldiers of climate” by the weather service, relay their daily observations electronically, and the data are digitally archived. At Wednesday's ceremony at a restaurant on the water in Hull, Skilling fondly recalled his early love of the weather and its ever-changing variety. Back in school, he would look at the window and watch the trees sway in the wind, he recalled. Skilling, a former National Weather Service employee, still does part-time shifts as a weather observer at the Blue Hill Observatory and Science Center, where he has worked since 1960. He has officially observed weather from his Hingham home every day since Sept. 10, 1960. He goes out to his weather box every evening at 8 p.m., almost to the minute. “I like to be precise,” he said. He logs the readings, then files them online. Where volunteers used to mail their logs once a month, they now arrive in moments. “They don’t have to wait until the end of the month anymore,” he said with a laugh. Skilling said his daily observations are a comforting routine, and that he relishes documenting the changes over time. But trekking outside this past winter, he admits, was a chore. “It got to be really tough,” he said. Across the table, Lautzenheiser agreed. Winter storms can get old, even for the most ardent weather enthusiast. A day shy of his 100th birthday, Lautzenheiser marveled at the weather he had documented from his Reading home since 1960. He had logged temperatures from well over 100 degrees to -17, and once measured more than 50 inches of snow in his yard. He began his career as a weather observer and forecaster in Akron, Ohio in 1940, and went on to be the weather service’s climatologist in Chicago. In 1956, he became the weather service’s climatologist for northern and central New England, and settled with his family in Reading. His eyesight isn’t what it used to be, and he admits to getting a little help with the readings from time to time. But he still enjoys the routine, and documenting that day’s weather in his corner of the world. “I didn’t suppose I’d make it this long,” he laughed on reaching the 55-year milestone. As a gift, the weather service gave Lautzenheiser a old lens from an automated weather system used at Logan Airport. Called ASOS units (Automated Surface Observing System), they gradually replaced human observers at airports, and Lautzenheiser hadn’t hidden his dislike for them. Even now, he still checks their readings, Buttrick said, and often finds small discrepancies, which he promptly reports. “He keeps us honest,” she said.